To boil the eggs, place the eggs in a saucepan and add enough cold water to cover the eggs by about 1/2″. Place the pan over high heat. When the water comes to a boil, remove from the heat and cover for 10 minutes. Dump the hot water and replace with cold water and ice cubes (“ice bath”) for several minutes. This will stop the cooking and make them cool enough to handle. 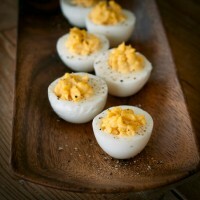 To make the deviled eggs, slice each egg in half widthwise. Spoon the egg yolks into a mixing bowl. Slice a sliver off the bottom of each half to create a flat bottom. Using a fork, mince the egg yolks. Add the mayonnaise, mustard, and paprika and stir until well combined and mostly smooth. If the mixture seems too lumpy you can use a wire whisk to make it smooth. Using a pastry bag with a large tip, fill each egg half with a dollop of the egg yolk mixture. Garnish the deviled eggs with a sprinkle of freshly ground pepper and sea salt. These look yummy, but no pickle relish?